Love Point Light was a hexagonal screwpile lighthouse built in 1872 at a cost of $15,000. It was located at the mouth of the Chester River and the Chesapeake Bay. 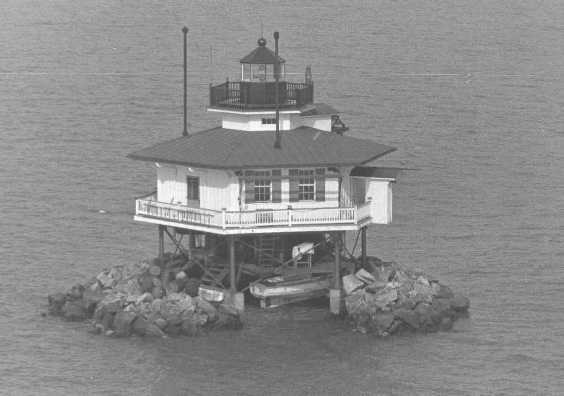 It was a duplicate of the original Choptank River Light. Two of the main columns of the lighthouse were broken during the first winter due to ice. Again in January 1879 ice banked around the lighthouse but no damage was sustained. Love Point was demolished in the 1960s. There is a small automated light on the former site of this lighthouse. Photo courtesy of Coast Guard.